Shopping for car seats for twins can be a challenge. Car seats are one of the most important things you need to buy for your babies. In fact, the medical staff won’t let you leave the hospital without car seats for your twins. 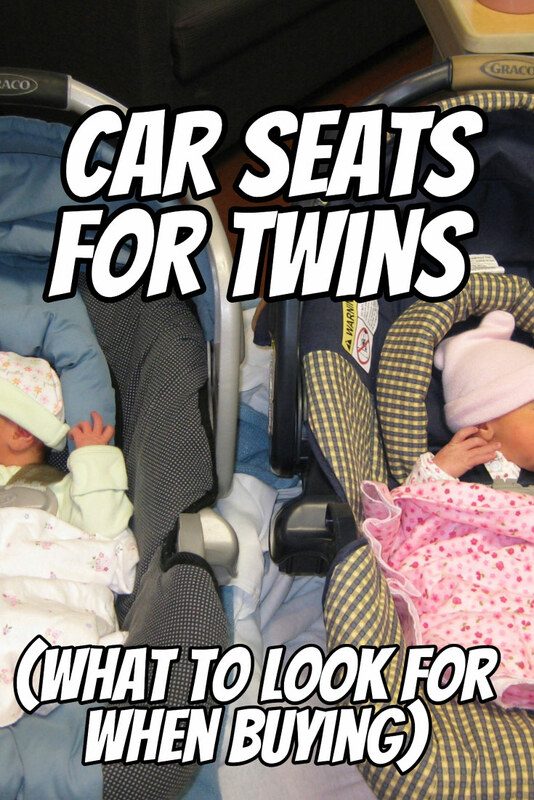 Unlike strollers or even baby carriers, there aren’t car seats made specifically for twins. Do your research and find a car seat you like, then buy two. One advantage of buying two of the same car seat is that you can interchange babies or positions in the car without having to remember the nuances of each particular seat. Even though you may buy the same model car seat for your twins, you can often get different colors, patterns, or styles. This is really personal preference but you might like some variety in the back seat. As your twins get older, they will have an opinion on which seat they like the best. Different styles could lead to them taking turns and sharing – which is always a good thing. One challenge of buying car seats for twins is that the babies grow so fast that they may soon outgrow the car seats you buy. The good news is that you can purchase a car seat that will accommodate your twins as they grow. A convertible car seat like the Britax Roundabout will work for your twins for many years. Check weight limits on the seats. Are they rear facing to accommodate newborn infant twins? Do they recline and then adjust upright to support a child who can sit up? Our girls started in a pair of Graco infant car seats. After about 6 months, they graduated to a pair of Britax Roundabouts that served them past their third birthday. If you can’t get by with just one set of car seats for your twins, don’t worry. You can look for a gently used car seat from a sibling or family member. One tip is that you shouldn’t buy a used car seat from an unknown source. Your babies’ safety is the priority when selecting a car seat. Do you want an all-in-one travel system with car seats and stroller? Or do you want to leave the car seats in the car and move the twins, as needed, to a stroller? Considering newborns sleep a lot, it was nice to be able to remove the car seat and snap it into the Snap and Go without waking up one of our sleeping girls. 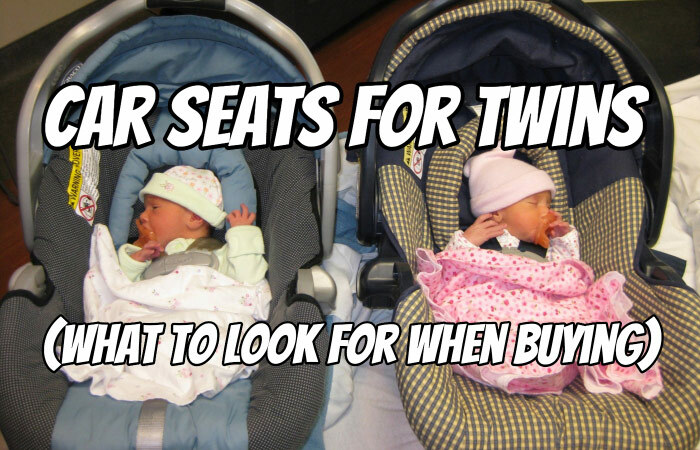 It can get expensive very quickly to buy car seats for twins. Don’t forget to ask for your twin discount. We purchased two car seats at Babies R Us (unfortunately, now out of business) and they gave us the “twin discount” of 10%. The features you want from individual car seats also apply to the car seats for your twins. Easy to clean – Can you quickly and easily remove the cover to wash it after your baby spits up or has a diaper blowout? Consider air travel – If you will be flying with infant twins and want them in their own seat, make sure the car seat is approved for airplane use. How heavy is the seat? How will it be to carry two car seats through the airport? Will you be moving your seats around a lot? Car seats can be pretty hefty. Five-point harness – You want your babies securely tied into place. Do the car seats fit in your car? Measure and test them in your vehicle before the twins are born. This is especially true if you have a small car. Latch anchors or seat belts? Most modern cars have a latch system for attaching car seats. Inspect your car and see how you will anchor the car seat. Be sure the car seats for your twins can safely be attached. I recommend you start with a pair of small infant carriers like the Graco car seats we used. Combine these with a Snap and Go inline stroller and you’ll be set for 6-8 months. Once your twins outgrow those you can move to convertible car seats like the Britax Roundabout that served our twins for more than three years. I also talk more about essential baby gear for your twins in Chapter Five of my book, the Dad’s Guide to Twins: How to Survive the Twin Pregnancy and Prepare for Your Twins. Another factor to consider is if you are going to extend rear facing (ERF) past 2 years. If you are then you need to consider ERF weight limits and shell heights. Also remember never to use latch and seat belt at the same time and ALWAYS read your manual for proper use instructions. Thanks for the tip on extended rear facing! @Jason – thanks for sharing what worked for your twins and some ideas of where to find good seats. Wow. As I will give birth to my twins next month, it made me realized to have one of this! Thanks for sharing.